Phew! meetings and meetings. Done! 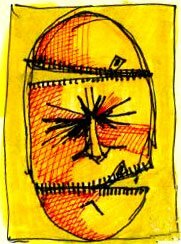 The picture today is Mr. Zipperhead--talking to the silence that is reinforced these days on all issues. Want to get started on an image for a "Google Monkey"--a phrase tossed out by Al Franken yesterday--to describe the people that google everyone and everything. I think I might be a Google Monkey too.